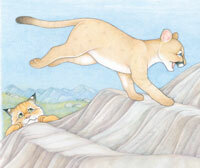 Colo the cougar and her friend Ruff, the bobcat, jump and play together, but Ruff can't jump as far as Colo. Ruff doesn't have a long, swishy tail like Colo does, to provide balance on long leaps. Ruff's tail is much shorter. He is sure that something is wrong with him. 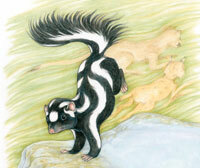 Sympathetic, Colo suggests they find a tail that Ruff would like better, so off they go. 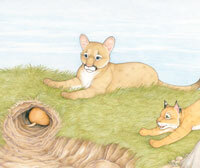 As the two kittens explore the variety of tails worn by other animals, they make the best discovery of all. 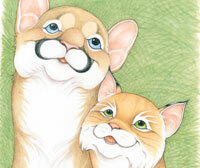 Vetters: This book has been vetted by Tiffany Dollins and Hardy Kern, animal program specialists at the Columbus Zoo. 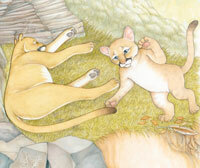 Lang’s nature tale definitely exists to teach, but young animal lovers will enjoy its quick progression. Klein’s realistic, detailed colored-pencil illustrations are a bit washed out but a good accompaniment nonetheless; some hide pictographs on the rocks that predict the story to come…A fine addition to science and nature collections. Diane Lang volunteers at two different nature centers where she gives programs and classes to share nature with young children-and that love of sharing nature led her to her writing picture books. 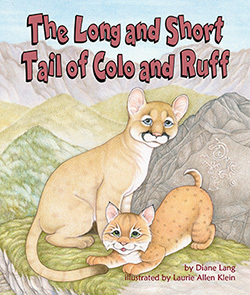 In addition to authoring The Long and Short Tail of Colo and Ruff for Arbordale, Diane's other books include Daytime, Nighttime, All Through the Year; Vulture Verses, Love Poems for the Unloved and Fur, Feather, Fin: All of Us Are Kin. Diane lives in California with her husband and several beloved pets-a gentle snake, two dogs, two tortoises, and two sweet tarantulas. Visit her website at www.dianelang.net.